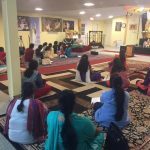 Categories: Divine Names, Satsang, Sri Sri Muralidhara Swamiji, Srimad Bhagavata Saptaham, Srimad Bhagavatam. “Madhura Utsav”, is quite literally a celebration of the Bhaagavatha Dharma, through the paths of Shravanam (listening to stories of His glory) and Kirtanam (songs). 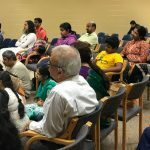 What makes the occasion more beautiful is the fact that the Utsav draws the entire community together to celebrate their collective love for Bhagavan. They say, when you mark the beginnings for such a joyous occasion, the word spreads and people are drawn, like bees are to honey, to be part of it, to offer their kainkaryams in various capacities and be soaked in the divine grace. 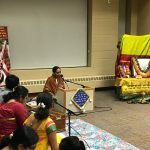 Madhura Utsav this year, in Minnesota was one such beautiful coming together of the Twin Cities community. This year it was held from November 13-19 2017. 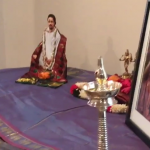 The tone of this year’s utsavam was set by the first ever Bhagavatha Saptaham in the Twin Cities. It was indeed a fortune for the satsangis to be able to witness, participate and offer their kainkaryams for this. 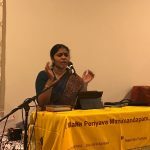 The week-long celebration started with a 3-day Upanyasam by Sri Gayathriji.What is the one charithram that entrances the young and the old alike, and only continues to grow sweeter with every repetition, and always leaves the listener yearning for yet another iteration at the end of it? Krishna Charithram, indeed! Titled Krishanubhavam, her pravachan took us through the essence of the Dashama Skandam of Srimad Bhaagavatham, right from His Jananam, to his glorious leelas, waxing eloquent on the Damodara Leela and Brahma Mohanam, amidst the others. Krishnanubhavam, a parama sukhaanubhavam, indeed! 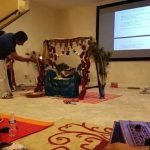 What is the one single thing that can be equally or even more blissful than His katha? The charithram of His devotees, who are the dearest to Him, of course! 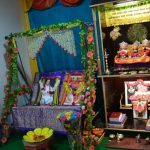 The next three days of our Madhura Utsav were heralded as “Bhakta Vijayam” – an occasion for us to glorify and celebrate the greatness of these Bhaktas and in turn immerse ourselves in the spirit of divinity. And who better to facilitate it than Sri Poornimaji, with her inimitable and absolutely gripping style of delivering Upanyasams. She took us through us through the charithrams of Meera Bai, Tyagaraja, Purandaradasa, Jeyadeva – each of them a Saint Vaggeyakara par excellence, with a wealth of compositions, vastly different from one another yet with the same purpose – to enable us to realize the essence of Bhakti Bhava. 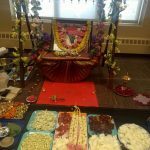 If there is one thing that the whole Twin Cities community looks forward to and participates at every single annual Utsavam, it is the grand Radha Kalyanam. Be it alankaram, neivedyam, Sugandha pusphpam, preparing for the bhajana or the other million logistics involved in an event of this scale, each activity was taken up with utmost shraddha to celebrate the beautiful parinayam of the divine couple in a Sampradaya Bhajana paddhati style, the highlight of which was the rendition of Ashtapadis by the Raga Kids Ashtapadi Ensemble, a wing of Gopa Kuteeram. The other main highlight of Madhura Utsav 2017 was the “Sampradaya Camp” for kids, conducted by Gopa Kuteeram. It was a day-long camp to take little kids on a heritage walk through the colorful streets dotted with rich art forms, exquisite cuisines, interesting traditions and much more. 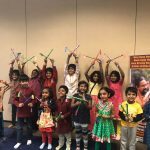 The children got to learn about the joyful dance form Dandiya and Ras Leela, where they made their own dandiya sticks to dance with. 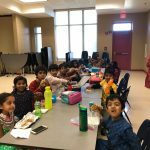 They were introduced to two unique, yet similar culinary traditions of Karnataka and Kerala. 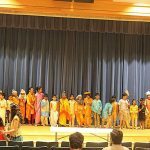 The camp also featured an all-time favorite of the kids – a Tenali Rama puppet show and some interesting fact snippets about the history of puppets. It was a wholly fulfilling and enjoyable week-long utsavam indeed, leaving the satsangis looking forward to the next one already!